Make our showroom your first and only destination for stylish, affordable, and low maintenance vinyl flooring. Our store carries a wide array of vinyl tile and vinyl plank flooring from national leading brands. We uphold an excellent reputation by offering long-lasting flooring, unbeatable prices, and professional experience you can depend on. Since we are locally operated, we are dedicated to helping community homeowners and business owners find the best type of flooring for their properties. From product selection to installation, we make the entire renovation process straight-forward and stress-free for you. Our showroom staff is always happy to guide you through our inventory and help you choose the ideal vinyl flooring for your design and budget needs. We listen closely to what you need and make suggestions based on the qualities that are most important to you. After you select your floor, we offer maintenance and floor care advice tailored to the style and brand you choose. Proper maintenance extends the lifetime of your vinyl sheet flooring and ensures it looks great long after installation. If you ever have any questions before, during, or after your purchase, we are here for you. When you need flooring that balances value with longevity, choose vinyl sheet flooring. Thanks to its solid construction and low maintenance requirements, vinyl is perfect for high-traffic areas. Even after years of heavy foot traffic and regular wear-and-tear, vinyl still offers stunning beauty and resilience. Among all the hard flooring types available, vinyl provides the impressive comfort and resilience, making it ideal for families with young children and pets. Vinyl sheet flooring is highly moisture-resistant, so it works great in wet areas like kitchens, bathrooms, and laundry rooms. It stands up well to scuffs, scrapes, and scratches, as well as stains. If you ever have a spill, a diluted floor cleaner and sponge or mop is all you need to make your vinyl floor look like new again. For regular care, only occasional basic sweeping or mopping is needed. Many people choose vinyl flooring because of its versatility. There are many options available to make the product suit your specific needs. For example, we offer three types of surface coatings, each with their own advantages. A no-wax surface coating works well in rooms with light traffic and little dirt exposure. Urethane vinyl coating, our second option, is more damage-resistant than no-wax. So, it is ideal for areas that receive regular wear-and-tear. Finally, we offer enhanced urethane for places that get extremely high amounts of foot traffic, grime, and heavy-duty cleaning chemicals. If you are unsure which option would best suit your home or business, talk to our vinyl flooring experts for a professional recommendation. 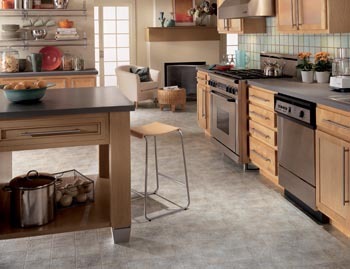 Add character to your home with vinyl tile flooring from our showroom. Vinyl tile products replicate the unique look of traditional tile, bringing the same timeless class and elegance without the high price tag. By installing a vinyl tile floor, you save big while also elevating the property value and visual aesthetic of the property. Since vinyl is so versatile, almost any tile style is possible. No matter what kind of material, size, color, or pattern you want your tiles to be, there is an appropriate vinyl tile flooring alternative. Browse our store’s massive selection of vinyl tile options by visiting our showroom. Get more value for your dollar by choosing vinyl plank flooring over hardwood. Vinyl plank floors allow you to get the same natural beauty of wood floors at a fraction of the price. In addition, vinyl does not require as much routine maintenance commitments. If you are pressed for time or cash but still want to upgrade your home or business, a vinyl plank floor is a great solution. Thank to vinyl’s visual versatility and special construction, it is possible for vinyl plank flooring to mimic nearly any kind of wood floor. Regardless of what kind of wood species, stain, or finish you prefer, you can find a product in our showroom that replicates the look perfectly. Ensure your new vinyl floor looks great for many years to come by trusting our store’s certified installers for services. We offer affordable vinyl flooring installation by experienced professionals, saving you the hassle of doing it yourself or finding a reliable contractor. Our installers are trained to work with every product you sell, so you can rest assured that your purchase is in safe hands. Furthermore, our vinyl flooring installation is backed by our Ultimate Confidence Guarantee. If you are unsatisfied with how your new 4-Star or 5-Star floor looks in your home or business, we will replace it at zero cost to you. Contact our floor store to learn more about our vinyl flooring products, installation services, and Ultimate Confidence Guarantee. We proudly serve the communities of Decatur, Forsythe, Mount Zion, Macon and Solomon, Illinois.